CORNER LOT, HUGE PRIVATE BACKYARD - AN ENTERTAINERS DREAM HOME. This 1937 Spanish Revival home is on a sprawling corner lot. 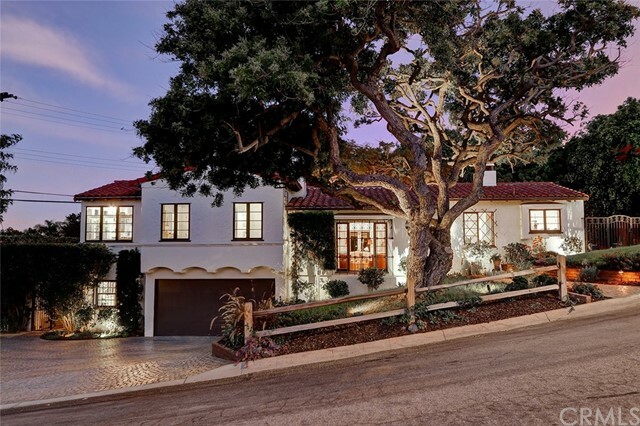 One of the original 36 classic Spanish homes designed by Hollywood Riviera architect/developer Clifford Reid. All 3 bedrooms have private bathrooms. The 3rd bedroom is perfect for the in-laws, a nanny or short-term rental featuring its own private entrance, bathroom and living room. This stunning home has the perfect flow for entertaining with the over-sized living room anchored by a stucco fireplace that easily transitions to the sun room, the dining room and to the completely remodeled kitchen including a CornuFé range, a breakfast nook and all-new custom cabinetry. Step into the backyard to your private oasis featuring a huge deck, fire pit, garden and expansive yard overlooking LA with low maintenance landscaping. Plenty of room for a future pool! Perimeter trees provide great privacy. The extra large master bedroom will be your private spa retreat. Enjoy a walk-in closet and en suite bath with heated floors, peek-a-boo ocean view, a clawfoot tub, custom-made vanities, a private toilet room and a rain head shower. Next to the master bed is the large 2nd bed with a darling window seat and direct access to the guest bath. This home features Spanish tile throughout, exposed beam ceilings, original hardwood floors, iron-grilled picture windows and interior french doors. Lots of upgrades! Best deal on the market. Don&apos;t miss this opportunity!